I can never leave well enough alone. That’s the gist of this post. Remember the other day when I couldn’t leave our white plastic mirrors alone? And I prettyfied them with Rub ‘n Buff? I couldn’t help it with this one. I really couldn’t. Because now I must Rub ‘n Buff all the things! And this time, the victim was our new light fixture for our foyer. Yes, new. Who buys a new light fixture and then paints it? This girl, apparently. The last time I showed y’all a glimpse of our freshly painted foyer, it was rockin’ this old chandelier. It’s so beautiful but I just wasn’t feeling it for our style. I blame the dainty porcelain floral tea set feel it had to it, but there was no WAY I was going to do any sort of DIY makeover to it. That’s blasphemy to antique lovers everywhere. So that beauty is getting sold to someone else who will appreciate it more. 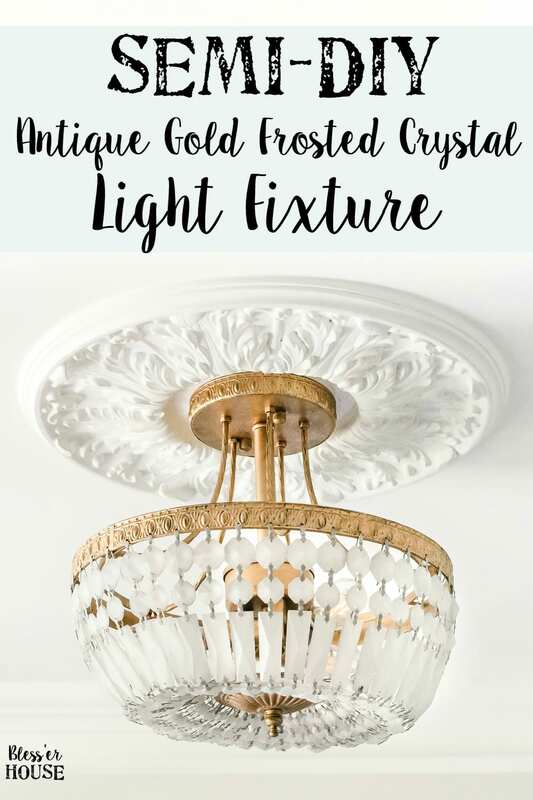 I had no idea what I wanted to replace it with, until I spotted this antique gold frosted crystal chandelier recently at Pottery Barn and instantly knew I wanted a semi-flush mount version just like it… only for maybe $250 less. So I found this cheaper black and glass version for about $100 on Amazon, and as soon as it arrived, I busted out the painting supplies. This is what the fixture looked like before. I really could have hung it up with the black and clear crystal and it would have still been gorgeous, but the idea of antique gold was too fun to pass up. I used the same tube of Rub ‘n Buff I had leftover from our mirrors I painted because a little goes a long way with this stuff. It took me all of 10 minutes to rub it all over the black metal using just my fingertips. And for any of the small, hard to reach details, I used an artist brush. 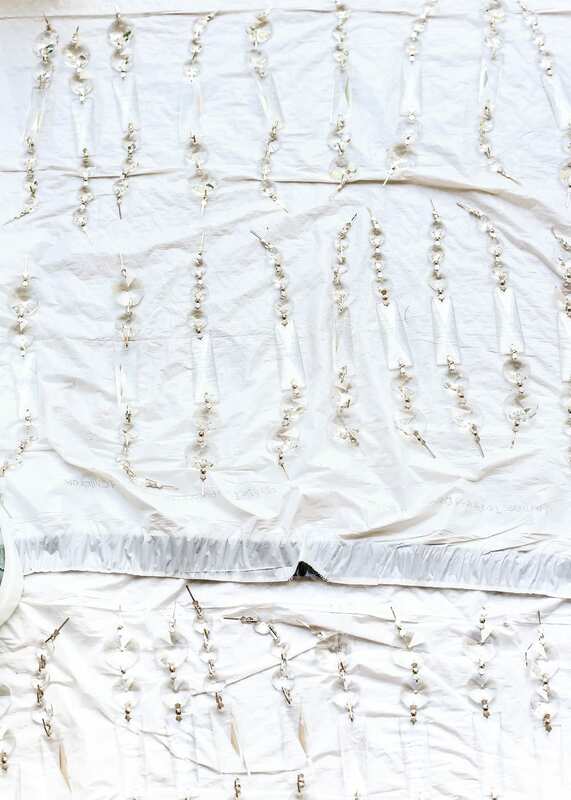 Since I wanted to antique the crystals, I laid them all out on a plastic drop cloth in our garage. I would never do this to expensive crystals, but since these are technically just inexpensive glass, I didn’t feel so bad about frosting them. 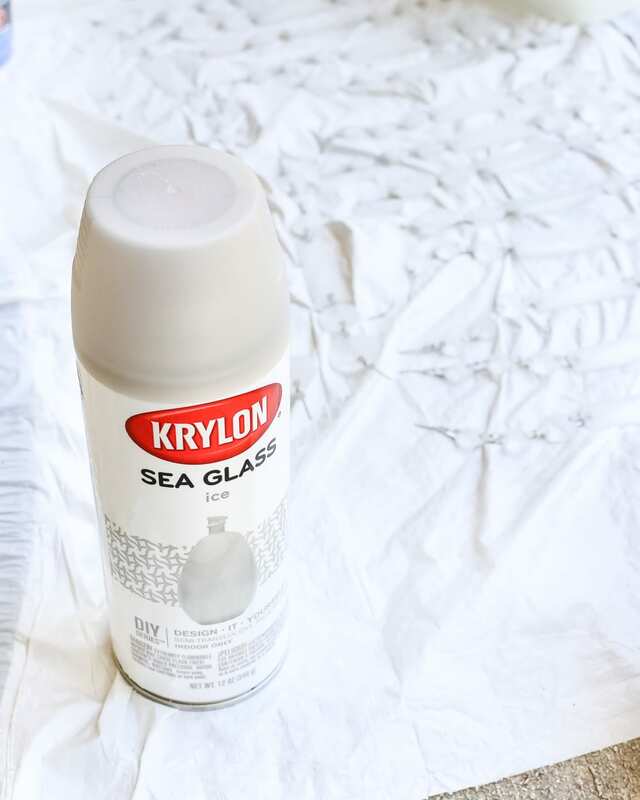 Krylon makes this beautiful sea glass spray I’d been dying to try (I was really tempted to use the aquamarine green color but decided on the more neutral gray). Just spritz on a coat (on the crystals I sprayed both sides) and glass is aged with this gorgeous sea glass effect. I want to try it out on some random jars and bottles sometime too. Once everything was dry, we hung it right up. Doesn’t it look so high-end?! The paint cost maybe an extra $10-15? I ended up finding this light almost exactly like it for $240. Mine cost me $120 total. 50% off isn’t too shabby, huh? So now the foyer is coming right along. It’s still not entirely finished on the staircase, and I might end up painting the pulls on the marble top chest so we don’t have so many mixed metals going on. See what I mean?! Wowza! 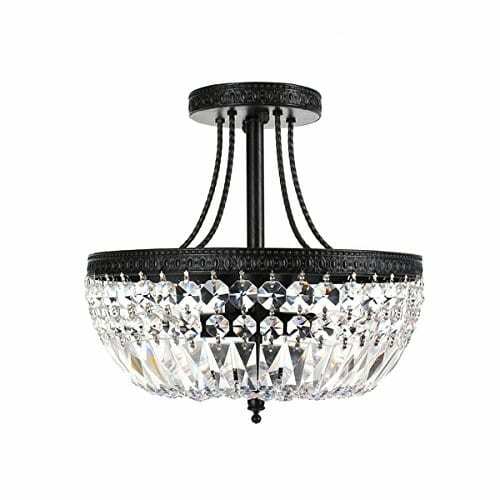 It’s even prettier at night when we have this fixture turned on and the crystals make the light dance all over the walls and ceiling. 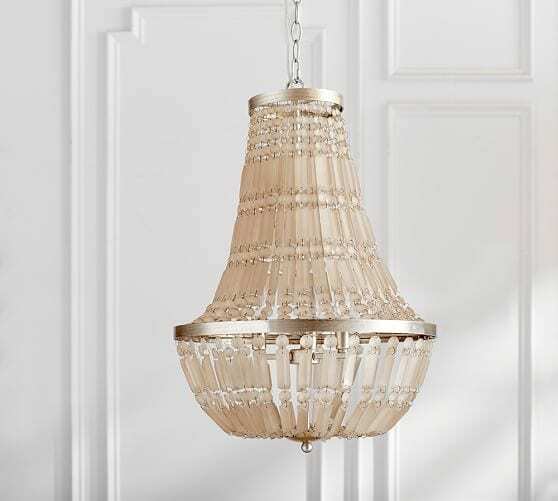 Have you had any light fixture makeovers lately at your house? Or painted something brand new? Am I the only crazy one here? 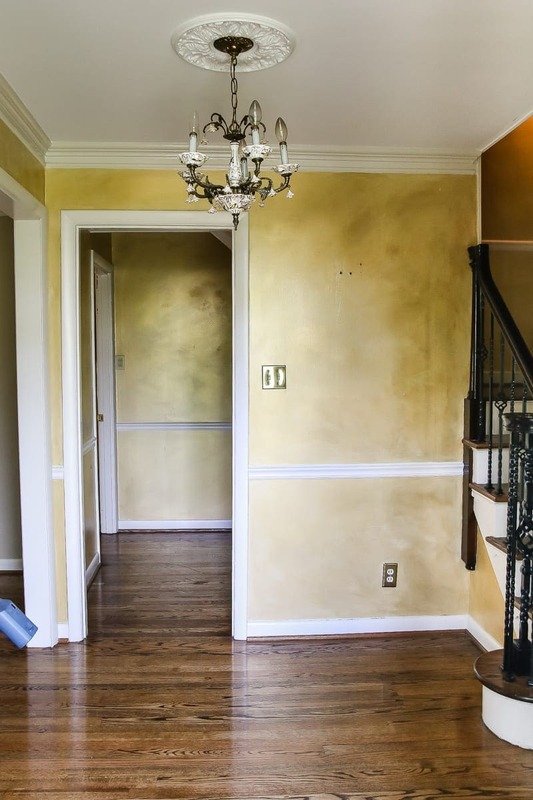 Oh wow, I am loving the transformation in this space! 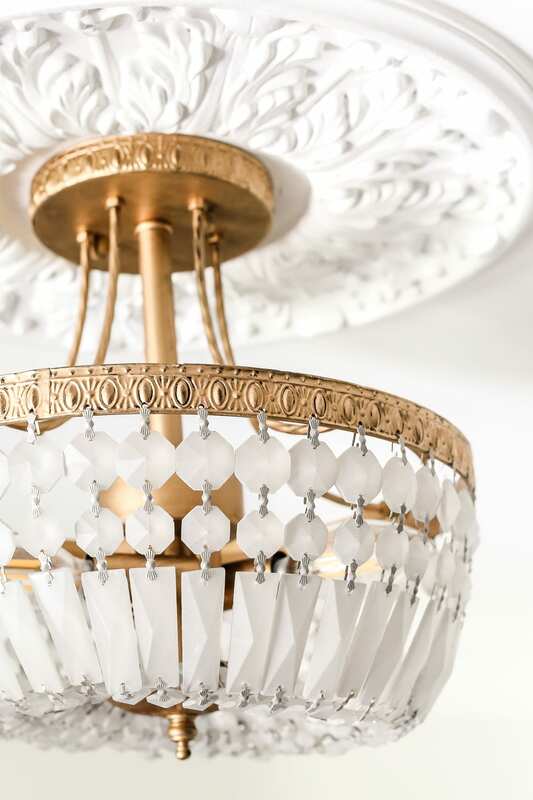 The new fixture is such a beautiful statement piece with its new diy treatment! 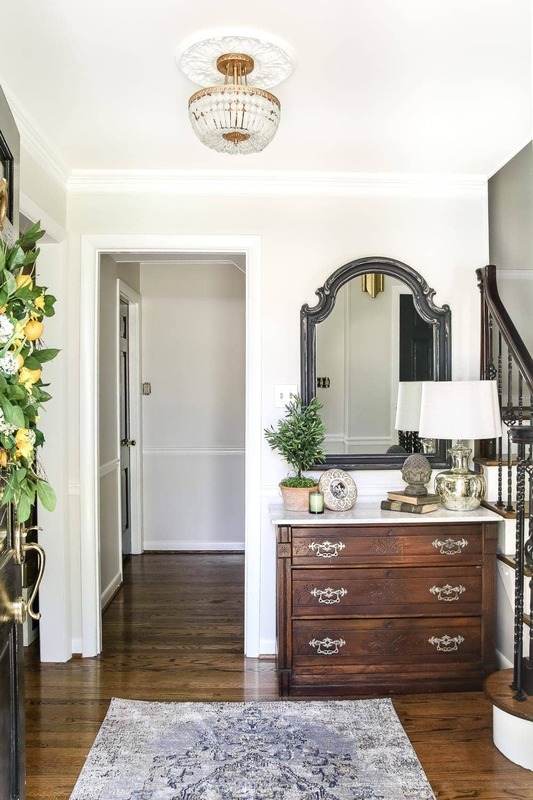 I’ve been wanting to do something similar in our entryway (we currently have one of those $80 home depot ultra boring chandeliers, woot), so I’m bookmarking this! Yay! Hope it comes in handy, Ellen! Wow. Love the new look! Love following you on your journey as you make this house your home. Thanks! 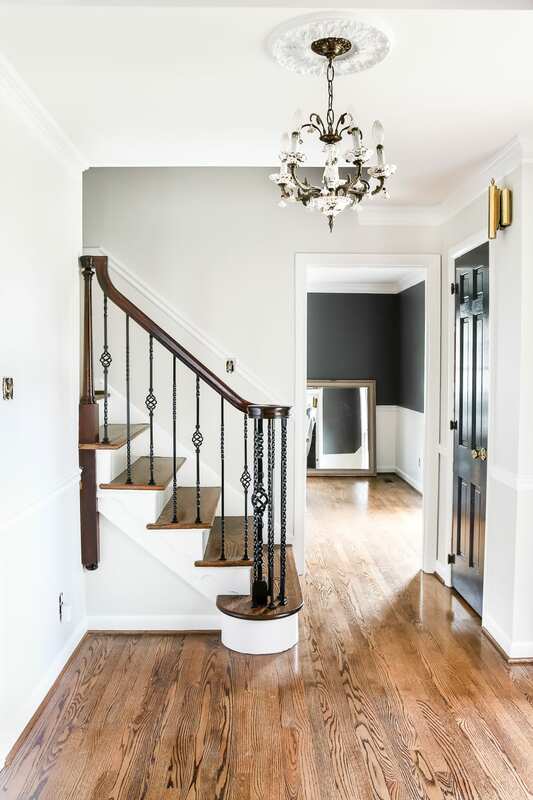 The color is Benjamin Moore Kendall Charcoal. 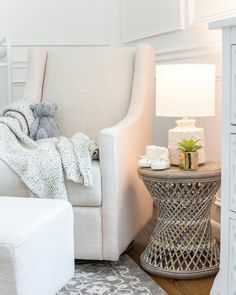 Can you please share where the rug is from? Thanks so much! The chandelier and the space looks wonderful! Love your creativity. Love that spray painted glass! It has such a pretty and unexpected effect! Just curious though – does it affect the amount or the quality of light that you get from the fixture? 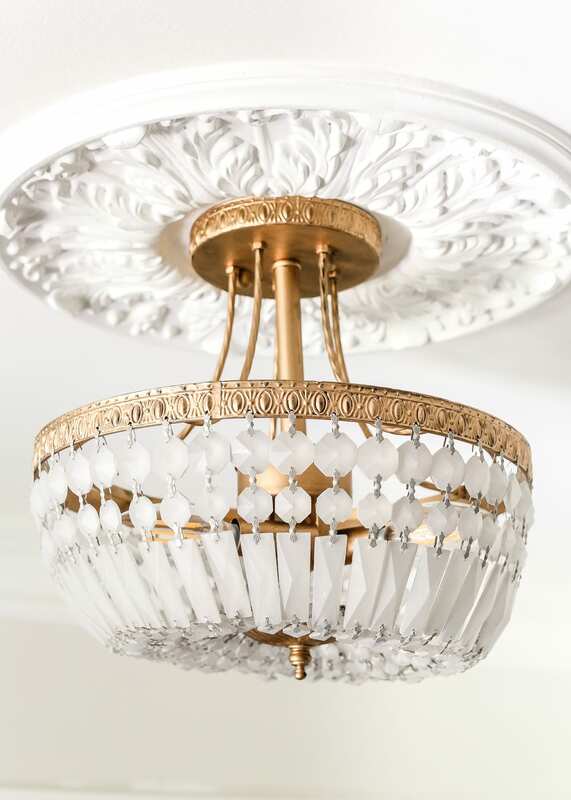 Sometimes the best part about crystal light fixtures is the light that dances around the room when it’s on. Just wondering how this affects it at all. Nope! It is still very bright and shines a lot like crystal would. I was nervous about that too at first. Love the light fixture. It looks amazing and the foyer looks amazing too. I wasn’t so sure at first but the outcome was a great surprise. 🙂 Thanks, Peg! Amazing makeover, Lauren. Love the gold. Holy Moly, I have to go get me some Rub n Buff! Beautiful and soooo would have never thought to do that. It always seems like so much work but you make it seem so easy! Love it! It’s addictive! 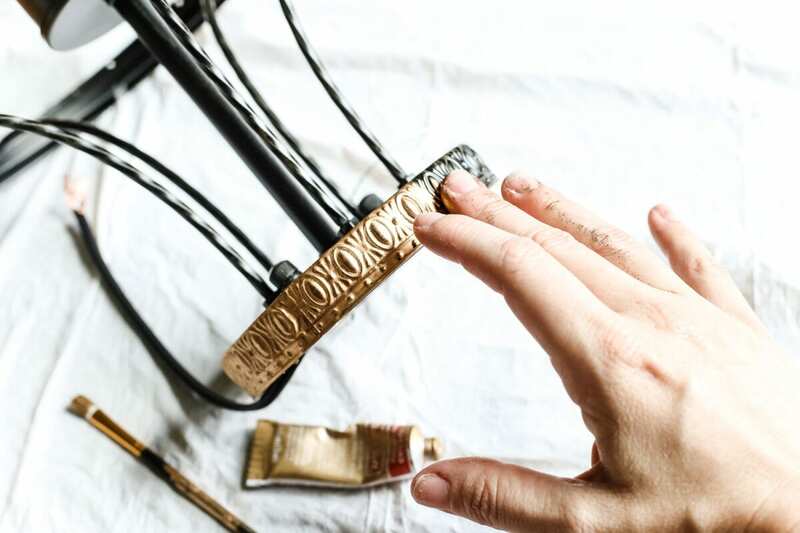 So much fun and has a much more realistic gold/brass look than regular spray paint. This one really was quick. An hour tops and it was done. Looks great! 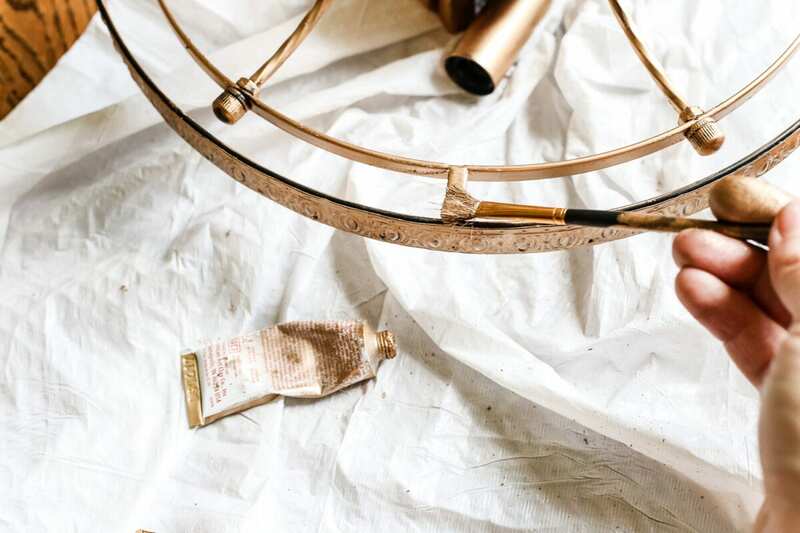 I took a brown colonial chandelier and painted it with grey chalk paint. It looks matte and more modern. Beautiful! I wouldn’t have known it was the same fixture. Thank you! I couldn’t believe what a difference it made. Lauren, your enthusiasm inspires me to “get my craft on”! I like the silver of your dresser handles. It plays off the crystals and actually defines each piece in their own special way. So honestly Lauren, I was thinking are you crazy? I thought it was going to look really old fashioned but not in a good way, more of an outdated way, Oh me of little faith! It turned out so amazing and I really think what added to it is the Krylon sea glass! 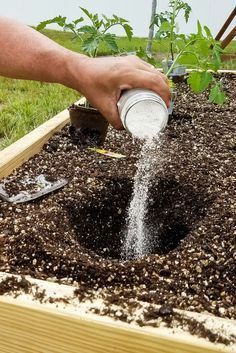 Spraying that over those glass crystals just was magic! You did it again! 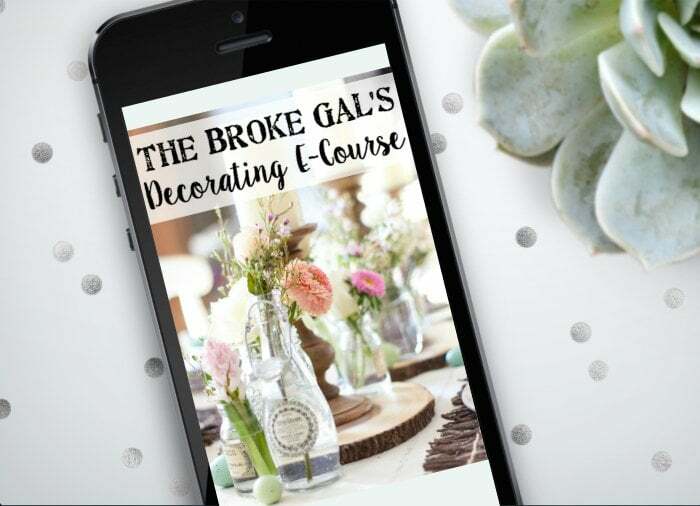 You are transforming your home so beautifully, and you inspire so much I just have to shake my head in glee! This light turned out beautiful! I’m in love and now I need to do this! Wow, Lauren that’s an elegant light! I would’ve been nervous doing this but it gives me ideas, thank you! and especially since you still have great light from it being frosted! Now, I’m looking at my lights a lot differently. The foyer looks amazing! Love the light fixture! 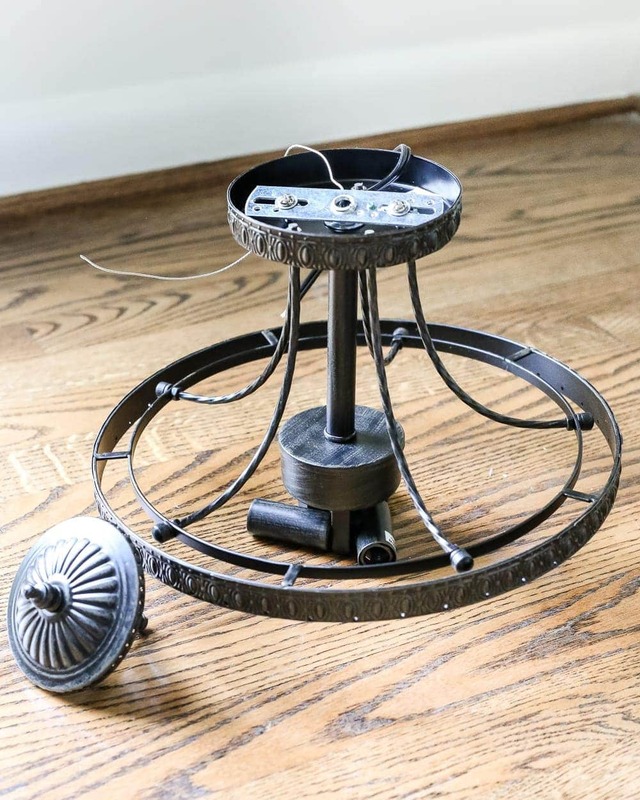 I adore that original fixture and would have keep it as it. I have to say I’m just not on that gold band wagon – just seems like a back to the 80’s thing. It’s creative what you did and I’m glad you got what you wanted for a cheaper cost than the going prices out there. The foyer looks lovely. Love everything you are doing! We just moved into our house and started our modern farmhouse decor transformation too. I live on your site and Instagram. 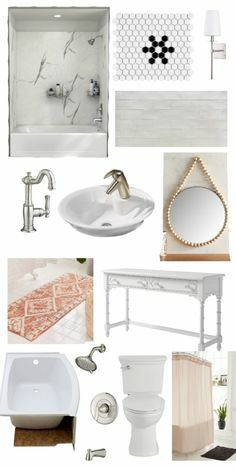 My powder bathroom is waiting for your reveal! Lol! Lauren, IMHO your chandelier is much more classy than the Pottery Barn one. 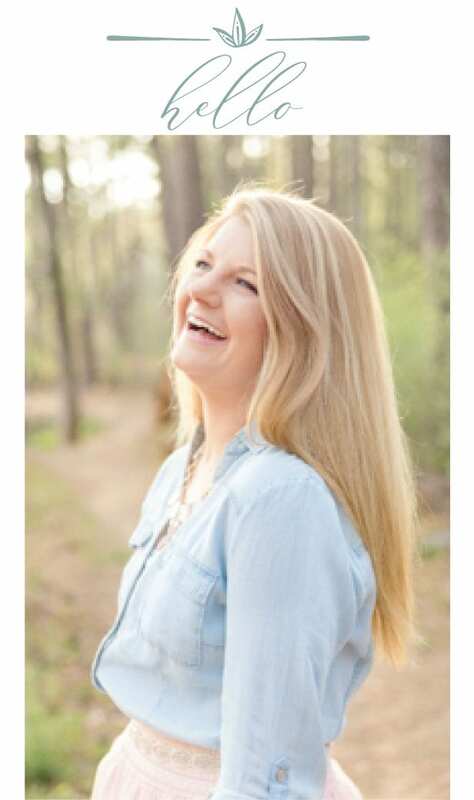 You are an inspiration, for sure. Thank you. Oh wow!!! I have been hmm which word shall I choose?? I’m no longer a skeptic!!! Is that the word? The spelling?? I could not envision your plan but it turned out so well!!! It is just so creative. I’m impressed that you were able to successfully spray the crystals. How is the light that it gives off now that the glass is frosted? Is it bright enough? I am amazed at all your ideas!! Just love your entry. I love this!!! I did the same thing – bought a new one and immediately painted it. Glad I’m not the only one! You’ve made me want to run out and buy another and add some gold leaf! Love this Lauren! Can you share more of that lemon beauty you have on your door?! 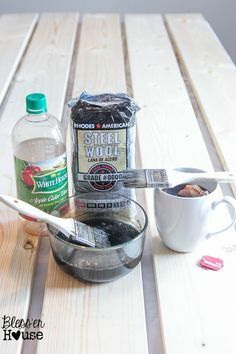 I just ordered the chandelier from Amazon with the rub a dub paint! I have been looking for months for a new chandelier for my bedroom and the minute I saw what you accomplished, I had to order it! Thank you for the inspiration. It’s perfect!!! I like it! I think the gold was a good choice…the black of the chandi would have drawn the eye up to it, now it’s a statement without taking center stage in the entry. You got it going on. You rocked that space, and the light and chandelier is fabulous. 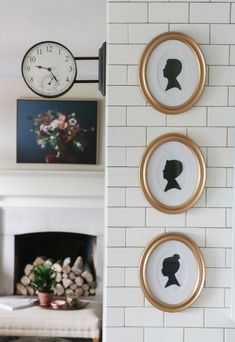 I love your decorative design ideas. Thanks for sharing. 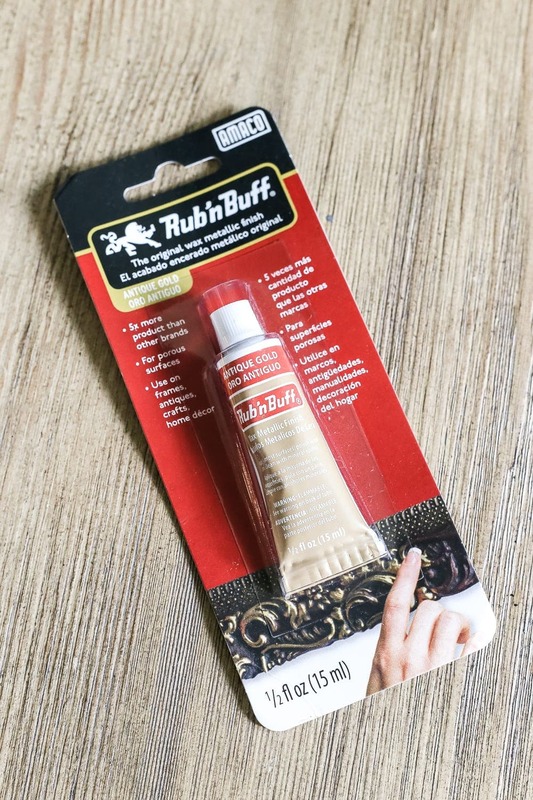 Rub n buff says to use on absorbent surfaces. Does is stay on the metal? I bought some and when I read the directions I was afraid it wouldn’t work on metal.